Periphyton development is generally negatively influenced by eutrophication in shallow lakes and reservoirs. To better understand the nutrient enrichment effect on the periphyton and how the changes in seston may interfere in community responses, we performed an experiment with combined and isolated N and P addition during the enrichment and no-enrichment period. Changes in biomass, nutrient content and N and P stoichiometry of periphyton and seston under enrichment were evaluated. Glass slides were used to assess periphyton responses in open-bottom mesocosms. Sampling was performed on the 7th, 14th and 28th day of experimental period. The isolated and combined P enrichment increased periphyton and seston chlorophyll-a on the 7th day, but only seston responded to isolated P addition on the 14th day. 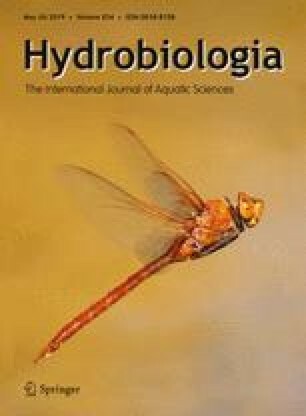 The isolated N addition had no significant effect on periphyton and seston chlorophyll-a. After interrupting the enrichment, there was high loss of biomass, changes in P content and a predominance of heterotrophic components in the periphyton. We conclude that periphyton responds rapidly to P enrichment, which has been identified as the primary limiting nutrient. However, periphyton was sensitive to changes in seston, which can interfere with nutrient availability, through nutrient interception, and light availability, through shading. The authors would like to acknowledge the FAPESP (Fundação de Amparo à Pesquisa do Estado de São Paulo) for financial support (Grant nº 2009/52253-4) and for a PhD Scholarship to RWL, DAT and TRS (Coordenação de Aperfeiçoamento de Pessoal de Nível Superior - CAPES, FAPESP Grant nº 2013/03130-2, respectively). We are grateful to all the students and technicians involved in the laboratory and fieldwork.